This website has both audio and video elements on the home page to allow the use of the companies radio advertising online. The site is self editable and allows for the addition and deletion of products as they change from season to season. 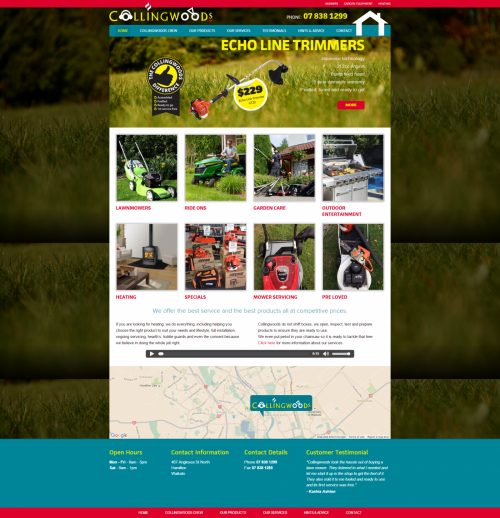 At Collingwoods we satisfy the needs of customers by providing a wide range of outdoor power equipment and home heating solutions. We offer the best service and the best products all at competitive prices. Collingwoods do not shift boxes, we open, inspect, test and prepare products to ensure they are ready to use. We even put petrol in your chainsaw so it is ready to tackle that tree.